Home Mind	How Donald Trump will save America! I still remember the night of the GOP primary debate 2016, a moderator asked Donald Trump about his negative views of women, most notably his use of the words fat and ugly. The Donald replied, ” He didn’t have any, and that he was only referring to Roseanne Barr. ” His words were epileptic in the minds of the deep south, his uncouth honestly resonated with the less intelligent and intolerant of Americans. It was at that moment that I knew The Donald was going to win the primary and the presidency, and the impending Wikileaks documents which disenfranchised the Liberal base only helped. I cut the cord years ago, I also stopped watching and reading the news per se outside of carefully chosen articles. But the misogynistic, ethnically divisive and abrasive words of the Donald piqued my interest. I started scouring online articles about the Donald. In disbelief I thought to myself, is it possible that the fascist neo-Nazi mentality and politics of World War ll has re-emerged in our day and time? When it was announced that The Donald won the electoral college I actually celebrated, I knew what was to come, I knew America was going to be great again! Unlike most who cried, were in a state of shock or inquired of emigrating to Canada and other civilized places around the world, I was preparing for the coming golden age of America. I have a talent for seeing where the dominoes will fall. I knew that all of the divisive racial and gender rhetoric coupled with the general incompetence of The Donald was going to do something to America that has never been done before. He was going to unify sane Americans, create a new political paradigm, and most importantly awaken women. The Donald by himself would not be able to do this unless he exhibited all the qualities and traits of the anti-Christ. The anti-Christ is the one who tries to destroy Christ consciousness. Christ consciousness has nothing to do with Christianity or the bible. Christ consciousness is an awareness where one sees the unity in all things and people, it’s devoid of judgment, it embraces peace, love, and joy instead of harboring the dark energies of hate, anger and intolerance. 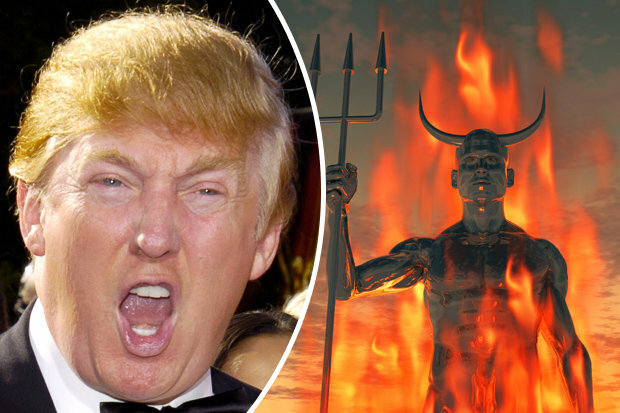 The Donald is indeed “the biblically foretold harbinger of the apocalypse”. But contrary to what people think apocalypse originates from the Greek apokálypsis ( ἀποκάλυψις) which literally means “an uncovering” a disclosure of knowledge or revelation. In a spiritual context, it’s a disclosure of something hidden, a revealing of heavenly secrets. In the Book of Revelation the last book of the New Testament, the revelation which John receives is that of the ultimate victory of good over evil. The Donalds hate, anger, and divisive incompetence are exactly what America needs right now. For too long we as Americans have been existing in a bubble of irresponsibility, wasting years of our lives away in Superbowls, Kardashians and other distractions, while ignoring the politics and plights of our country. So far we are in year 1 of the anti-Christs presidency and it could not have been any better. The exact opposite of the anti-Christs plan is happening, people are coming together, women are becoming socially aware and are getting involved in politics. Recently a Democrat won a special Senate election in post civil-rights era Alabama, that’s like a Hezbollah field general winning a mayoral election in Tel-Aviv. I don’t see the Donald surviving after the mid-term elections, I believe either the New majority democratic congress will remove him, or the FBI investigations will force him to step down. The dark era of conservatism is almost at its end, America is moving towards a progressive pivot with a strong new awakened electorate. But none of this would have been possible without the anti-Christ Donald Trump. So we must thank the Donald. Spot on. He is waking up the US and exposing our deepest ails so they can be healed.